What To Do When The Systems Don’t Stick - Organising Works! 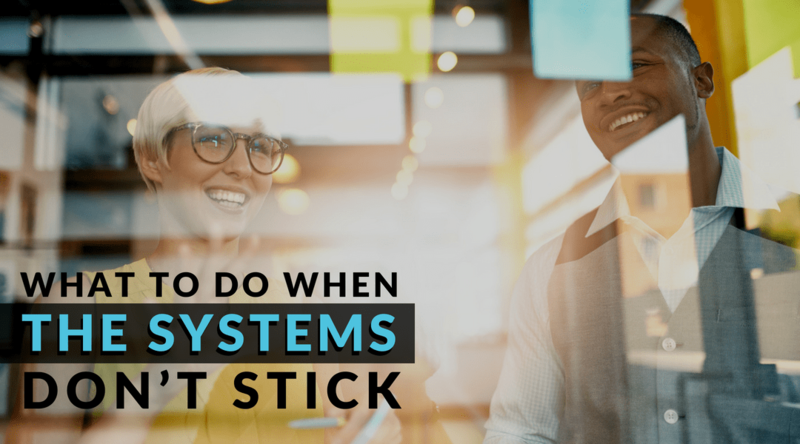 So here’s the thing, it’s not easy to get your team to fall in love with systems especially when they are super busy and see the systems as a hindrance rather than a help. For you, the business owner it can be demoralising. You’ve put in a lot of effort to build systems, you have involved your team in the process, you have done all the right things but still, there is resistance from your team. Staggeringly, 70% of business transformation efforts fail due to lack of engagement (Source: Gartner Press Release). When you put time, money and effort into systemising your business and with so much at stake, you can’t afford to fail at change. Adoption and engagement of your systems and processes are paramount to the success of the systemisation process and for the business to transform. Gamification is an engagement tool, the same initiative that game designers use to keep players interested. It’s the carrot on the stick that keeps the rabbit keep chasing. Disclaimer – before you consider putting this strategy in place, make sure you have implemented systems into your business the right way. I suggest that you read my article on 5 Ways to Get Buy-In From Your Team. In the article, I briefly covered the strategy of Gamification. To understand what Gamification is and how it can assist in the adoption of systems, let’s dive deeper into this playful strategy. Gamification incorporates the elements of recognition and rewards. In the context of learning, gamification is the integration of gaming to create a highly effective learning experience and learning retention. When applied strategically, gamification encourages systems adoption by challenging the team in a controlled environment. Gamification promotes friendly competition, creates a sense of achievement and motivates individuals or teams to be consistent with the use of the systems. Ultimately the outcome we want is for our team to be engaged with our systems as part of the business culture. The purpose of gamification, from a business owners point of view, is to encourage the behaviour you want. However, a behaviour is a hard thing to change. Without delving too deep into the psychology of behaviour, there are three elements to successfully changing behaviour according to Professor B.J. Foff at Stanford University. To be effective, all three elements have to happen at the same time. If all these conditions are met, gamification can change behaviour, create motivation and keep employees engaged. Gamification can change behaviour, create motivation and keep employees engaged. It’s important to note that before you introduce gamification that you first find out where the resistance is coming from. Ensure that you have applied the other 4 strategies to successful systems implementation as described in my previous article. Additionally, spend time with each team member individually to figure out what the non-compliance issue really is and working through solutions together. After that, if you’re still experiencing challenges around systems adoption and you have addressed other reasons for non-adherence, then it’s worthwhile applying gamification to help get the systems implementation across the line. Before you introduce gamification, first find out where the resistance is coming from. This could be a simple survey where you encourage feedback on systems and processes and you recognise their input and response. A systems quiz is also a great tool to gauge your team’s understanding of when and how the systems and processes are used. Recognise the team members who score the highest. This is a great way to recognise who in your team could be considered for a systems role in your business. The learning path is converted into a game featuring scores, badges and leaderboards. When implementing any type of training, a game that forces the learner to apply newly acquired skills will have a higher impact on knowledge retention. Scenarios training can be effective for product knowledge training. Learners have to help their client understand the features and benefits of their product. Each level of the game can be a topic in which the team have to progress through, completing challenges and earning points or trophies along the way. Leaderboards can be added to impart the sense of social recognition. Habit forming challenges are designed to make the team aware of what they need to achieve to complete a challenge. In the context of systems adoption, the simplest challenge would be to recognise the consistent use of the systems and processes over a period of time. Recognise those team members with the highest adoption rate of your systems. Internet marketing Inc wanted their sales team to actively collect more leads into the business. They motivated their team by incentivising this with a competition that awarded sales representatives based on how many leads they collected over several months. In less than 3 months they had doubled the number of leads that they had previously collected over 3 years. In this example, the outcome was that the team had more engagement in their job and encouraged them to stretch just that little bit further. There are plenty of ideas depending on what your adherence issue is, you can get creative in your approach. Remember not to make the challenge too difficult at first. Make the challenge weekly or monthly, your team will lose interest if the challenge is too long or overly complicated. Come up with rewards rather than punishment. For more serious offences such as safety compliance, consequences such as disciplinary action are appropriate. Rewards don’t need to be expensive or elaborate, your team will appreciate the recognition more so than the actual prize. If you are going to use negative rewards, make sure they are lighthearted such as buying cupcakes for the office when they fail to follow a process. Try to understand your team’s personalities and find a challenge that will be well accepted. Understand your team’s personalities and find a challenge that will be well accepted. Make a big deal of those team members who made a great effort and got to the top of the leaderboard. Post announcements in company newsletters, on your intranet board or in your general Slack channel. Recognition will encourage future participation. Using the systems and processes in your business is part of your business culture. It is important that every employee understands that the processes are there to help the business run efficiently, productively and without error. While there may be more underlying reasons why some team members adopt the systems and processes better than others, there are strategies of which gamification is one of them, that can assist in making it all stick. It would be a terrible shame if all your hard work comes to nothing because your transformational changes were not adopted by your team. It’s a big problem but with the right approach and some creativity, there are solutions. It has to be said that engagement still requires strong leadership and inspiration to stick. No matter how great the game is, it needs to be part of a larger systems culture strategy to truly transform the business. If systems adoption is an issue for you or you are at the stage of planning for systemisation, I might be able to help. Book in a Systems Success Call and we can discuss strategies to transform your business.